The great Cathedral of Notre Dame de Chartres is a grand old lady; a very grand old lady indeed. She stands proud on a hill overlooking the town, and in her own subtle way she leads you gently back to the middle ages. For one thing you see her, lit up and resplendent in the distance as you drive across the great plain towards the city. The skyline, unlike so many modern skylines hasn't been built up to suffocate her wonderful silhouette. 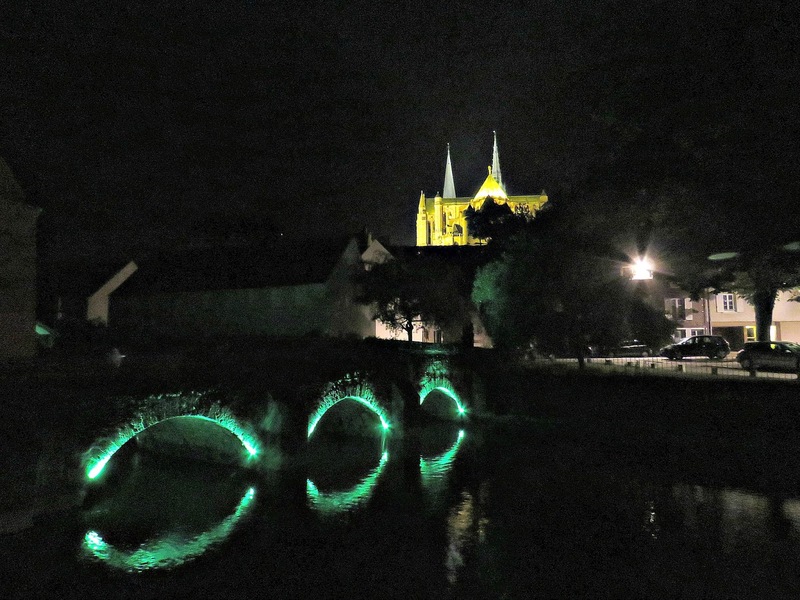 OK, the medieval pilgrim travelling at night wouldn't have been treated to the light show, but you can sense how he would have stood still in wonder and amazement, and mopped his brow, as he first beheld her in the distance. Chartres is a city with many charms, not least of which is its well preserved historic heart. 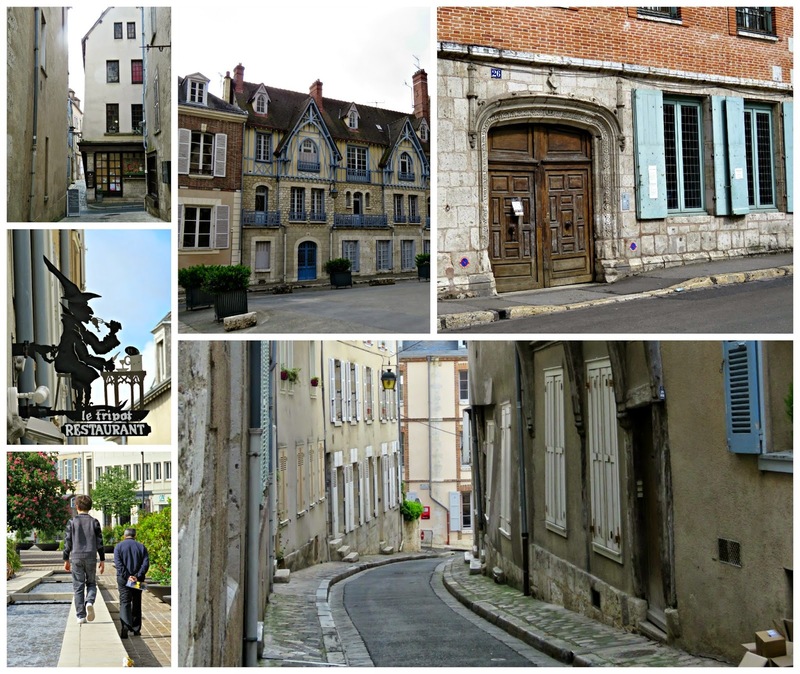 You wander down tiny, higgledy piggledy medieval streets that positively ooze character. And then - ka-boom! Out of nowhere you suddenly come face to face with the grand old lady herself. You've wandered blindly down streets so narrow that it was hard to even see the sky above you. And then it's almost as though she jumps out at you and shouts Boo! 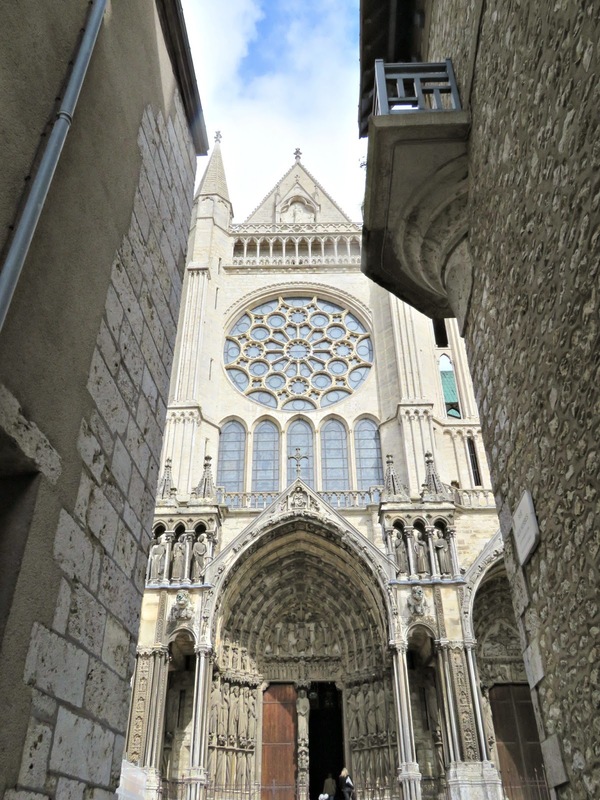 The Cathedral is dedicated to the Virgin, and for over a thousand years they've kept a powerful relic there: the Sancta Camisia, a garment that the Virgin was believed to have worn at the birth of Christ. It had been sent to Charlemagne by the Empress Irene of Byzantium, and was donated by his grandson, Charles the Bald, to the Cathedral in 876. 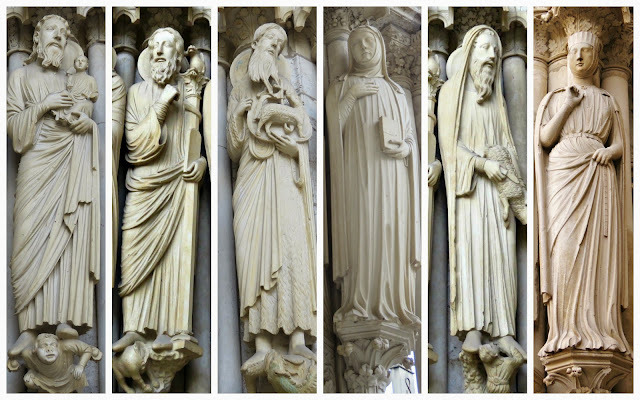 It's hard to get your head around the medieval mindset, but back in the day there was a strong belief that the Saints would intercede through their earthly relics. And, as devotion to the Virgin grew and developed through the 12th and 13th centuries, so too did the importance of the Sancta Camisia. 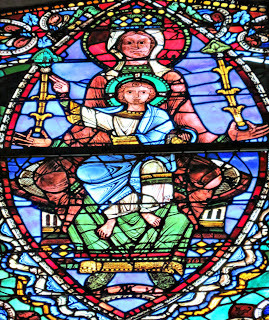 Pilgrims would come to pray for the Virgin's intercession, and Chartres grew in importance as a place of pilgrimage. Before long it was thought of as the earthly palace of the Queen of Heaven. 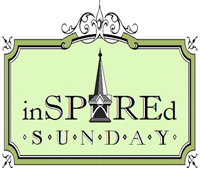 The normal folk of the town were no doubt grateful for the prestige and trade that this brought their way, and deep in their hearts, they cherished the belief that, through the presence of the holy relic in their city, they enjoyed the special protection of the Virgin Mary herself. So powerful was this belief that when the city was attacked by the Vikings in 911, the Bishop ordered the Sancta Camisia to be displayed on the ramparts. Its effect was miraculous and immediate: the Viking leader, Rollon, fled, then made his peace with King Charles III, converted to Christianity and was duly rewarded for his about-turn by being invested as the first Duke of Normandy. 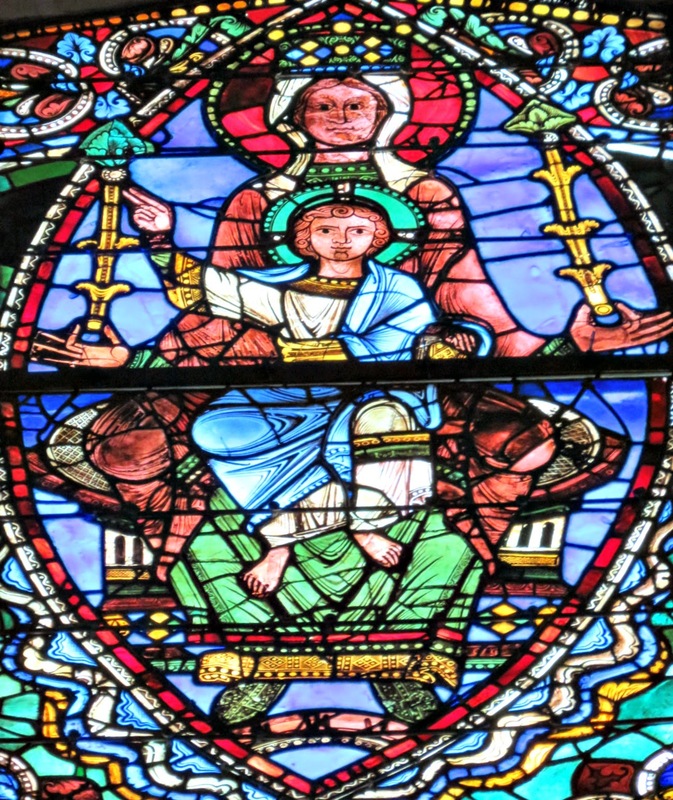 The Marian Cult grew and developed, and learned scholars and bishops from Chartres played their part in the establishment of the Marial liturgy. 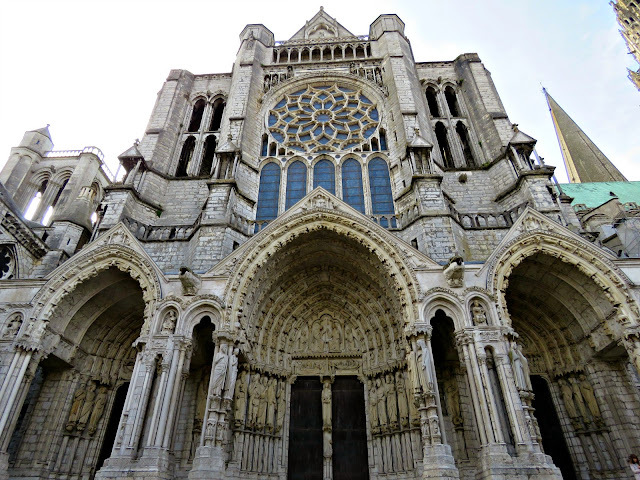 Then, on the night of 10th June, 1194, a terrible fire raged through the heart of Chartres and the cathedral was severely damaged. Many lost their lives and many more lost their homes, their livelihoods and all that they possessed. It was a dark time; hunger and despair stalked the streets of the city. Looking at their ravaged cathedral the townsfolk lamented the loss of the holy relic and, with it, the special protection of the Virgin. It seemed as though she had forsaken them. Then, on the third day after the disaster, a bedraggled procession of monks appeared through the smoke and ashes, winding their way precariously down the charred streets. The people stopped and stared. There was a collective intake of breath. They rubbed their eyes, because they didn't believe what they saw. But, sure enough, they hadn't been mistaken: the monks bore aloft the holy relic as though in triumph over the powers of darkness that had sent fire to destroy the city. Miraculously they'd saved it by taking it deep into the depths of the crypt to escape the fire. 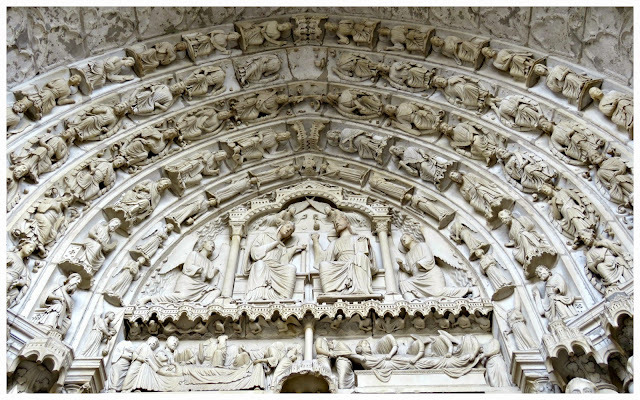 There was immediate rejoicing: the Queen of Heaven still held Chartres as her earthly home, and in response to the exhortations of the Papal Legate, the people of the city made it their business to rebuild the Cathedral, making it bigger, better and grander than before. Contemporary tales speak of them going in their thousands to the quarries at Berchères to help carve out the blocks needed for the project. Working as one, chanting psalms, praying and saying the Rosary they dragged heavy carts, laden with stone, the long, slow 5 kilometres to the site of the cathedral. Royal sponsors were found. Richard the Lionheart allowed funds to be raised in England for the project, even though he was technically at war with France at the time. It took a long time, way back then, to raise this Leviathan of stone, but by 1222 the sweat and sinew of the workers had produced something truly astounding. 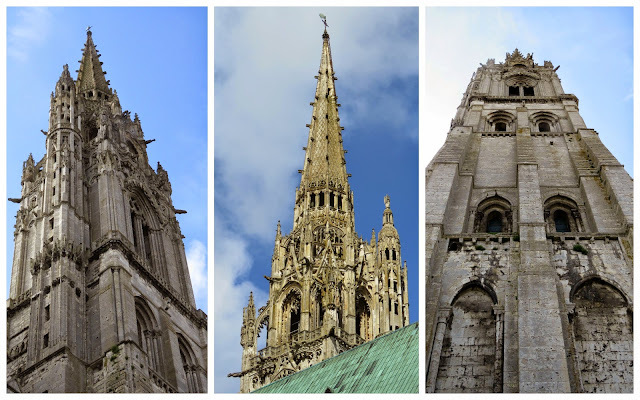 William, the Breton, wrote of it in his court chronicle: None can be found in the whole world that would equal its structure, its size and decor ... the Mother of Christ has a special love for this one church ... None is shining so brightly ... rising anew and complete, with dressed stone, already finished up to the level of the roof. If fills the interior of the cathedral. You see it everywhere you look. It has the deep lapis lazuli of a southern sky on a clear summer day. To put the case simply: it is truly exquisite. The colour most closely associated with the Virgin in art is that deep summer-sky blue with which her cape is usually painted. It was produced using lapis lazuli, the most expensive pigment in the Old Master's cabinet, imported along the Silk Route from far-away Afghanistan. 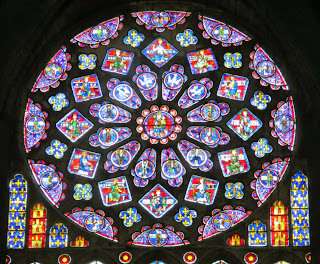 It is that same Virgin Blue that shines from the windows of Notre Dame de Chartres. As is the case with most, if not all of the great Gothic cathedrals of Europe, the original architect is unknown. But he came up with a new architectural style, reducing the body and volume of the stonework to introduce larger windows that had ever been created before. It must have been one of the greatest and most prestigious building projects of its day. I mean, let's face it, this one was backed by no less a figure than the Virgin herself. So not surprisingly it attracted many of the greatest master craftsmen and alchemists from across the known world. Remember back then alchemy (along with astrology) was a respectable scientific discipline, and those alchemists would have learnt quite a lot of chemistry in their search for the elusive formula that would turn base metal into gold. 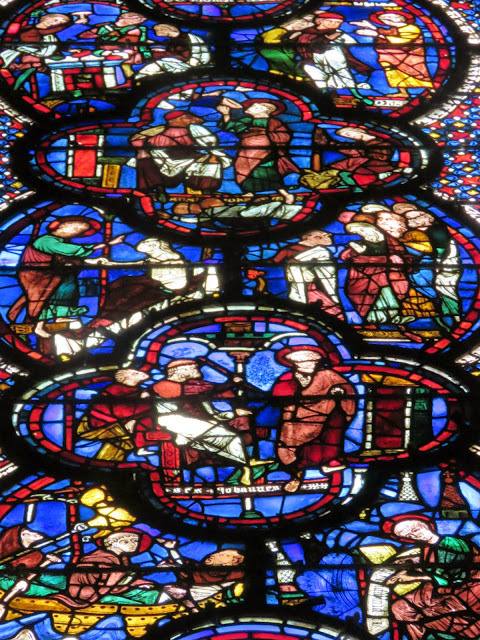 And here's the thing: way back in the 12th century, they cooked up a new blue for the windows of Chartres. Something similar appears in Saint-Denis, but apart from that it's a pretty unique pigment. I've never seen a blue of such intensity before. The method by which it was produced was a closely guarded secret, known only to a trusted few at the head of the guild. They would have jealously guarded the formula for its composition, anxious that no other town should steal the prestige of their unique glass by replicating its colour. As time rolled on the Gothic movement ran out of steam and fell from favour. More great buildings were built in different styles, but the enthusiasm for this jewelled glass waned, and the secret of how to make it was lost. 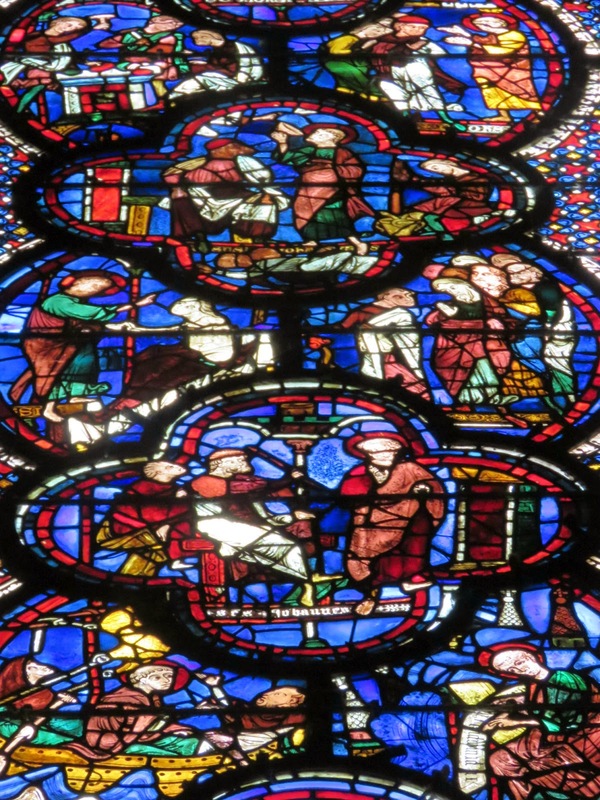 Of course cooking up a similar shade of blue to make some stained glass is not beyond the wit of modern science, but no one knows exactly how these master craftsmen produced the wonderful windows of Chartres back in the 12th century. Tests have revealed that the luminous blue glass was made from a sodic flux coloured with cobalt. This produced an extraordinarily stable material that has stood the test of the centuries and today looks pretty much as it did when it was first made. On average the pieces of glass that make up these windows are an inch thick. 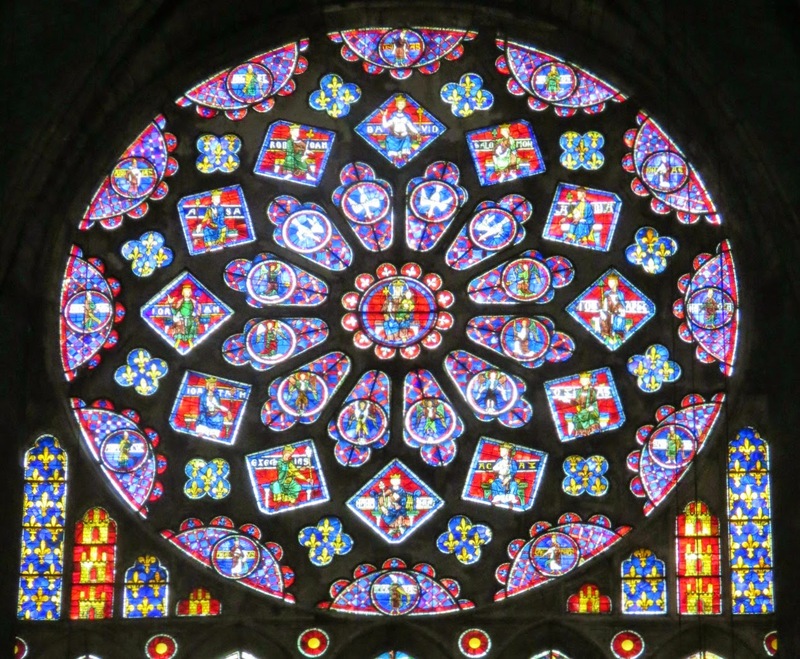 Compare this with the stained glass windows of the Gothic Revival in the 19th century, which are on average an eighth of an inch thick. This thickness made them more robust, assisting with their survival, and, the added depth of pigment that came with the depth of glass, added to the intensity of the colour. But of course all this beauty came at a price. And here's the thing: back when they were made it's reckoned that it would have been more cost-effective to have to have filled the window spaces with precious stones. Manpower was cheap, but even so the materials, the intricacy of the detailing and the thousands of hours of labour that went into producing them came at a huge cost. The townsfolk and the various royal sponsors were clearly happy to pay, and the windows, having stood the test of time, remain the crowning glory of the great cathedral. 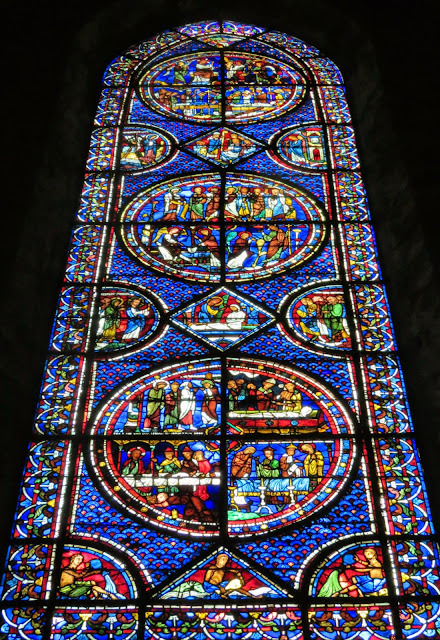 152 out of the original 186 windows survive, making Chartres the greatest treasury of medieval stained glass in all of France or, as some might say, a fitting earthly home for the Queen of Heaven herself. A wonderful commentary to go with the pictures. 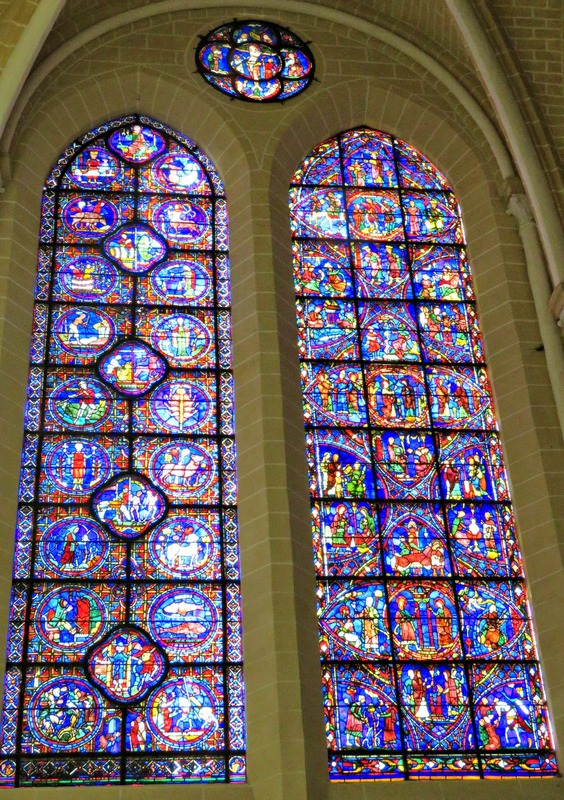 The stained glass is really magnificent. Oh my!!!! The deep lapis blue is exquisite! I learned so much from your post and the photos are incredible. It's such a shame you can't get a batter shot of the outside because of the encroaching city, but I LOVED the snap you took at the red light. It is awesome! Loved everything about this beautiful cathedral, and thanks so much for including so much information. The photos and information are quite interesting. The amazing details just blow me away! I must admit it's a bit late right now and I am too sleepy to read everything, but I have been oohing and aahing at all your lovely photos! :) I just love these stained glass windows. Wow! Will be back another day to read the text too... sweet dreams for now.